At a 3 day symposium in Chania, Crete, in November 2010, Interventional Cardiologist, Antonis Pothoulakis, MD, FACC, outlined the benefits of a diet high in olive oil. This follows on from the famous “Seven Countries Study” which found that Cretans had low morbidity and mortality rates from coronary heart disease compared to other countries. Of course diets are changing and, recently, the Cretan Quality Agreement was set up to certify restaurants which only use virgin olive oil in their cooking. The active ingredients in the oil are high levels of Oleic acid, a mono-unsaturated fatty acid, Polyphenols, Vitamin E, Squalene, Terpenic acids and Phytosteroles. All these work together to combat common diseases. Epidemiological and other studies have provided indications that a diet rich in olive oil reduces the risk for breast, pancreatic, gastric, laryngeal, and urinary tract cancer. Vitamin E effectively protects against the development of oral, colon, skin, lung and breast cancer. Squalene has been found to strengthen the cancer killing properties of a number of different anti cancer drugs. Animal studies have also shown that Squalene can confer protection against leukemia, colon, skin and lung cancer. Polyphenols have shown antitumor action. It appears that both mono-unsaturated fatty acids (like those contained in olive oil) and poly-unsaturated fatty acids (found in fish and other vegetable oils) lower blood pressure. 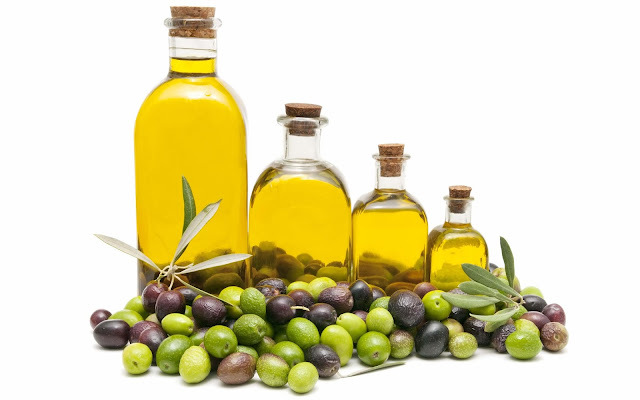 Recent Italian research in patients with known hypertension has shown that consumption of 40 gm of olive oil a day can reduce blood pressure by about 50% - almost half of the patients were able to reduce their blood pressure medication or stop taking it altogether. The main active ingredient seems to be Polyphenols. High LDL cholesterol contributes to atherosclerosis and atherothrombosis, depositing cholesterol in the artery wall and clogging the arteries of vital organs like the heart, brain, and kidneys. HDL cholesterol is the “good” cholesterol and acts as a scavenger, removing cholesterol from plaques in the artery wall. Reducing LDL cholesterol and raising HDL cholesterol has significant health benefits and protects against heart attacks, strokes, and sudden death. Polyphenols and vitamin E also prevent oxidization of any LDL preventing fatty deposits building up in the arteries and reducing clot formation or thrombosis. The Polyphenol and Squalene components in olive oil reduce the high level of inflammatory activity present in Diabetes. A diet rich in olive oil also facilitates glycemic control by leaving “less room” for carbohydrates that cause insulin spikes and premature hunger attacks. Simply it acts as an appetite depressant and can prevent obesity. Inflammation and free radicals damage brain cells and impair synaptic function, contributing to neuro-degeneration and brain cell loss that characterizes Alzheimer’s disease. Squalene (along with the other antioxidants) does not allow oxidation of the mono unsaturated fatty acids thus reducing nerve damage. Oleocanthal, another olive oil component, has been shown in scientific research to slow the progression of Alzheimer’s. Free radicals attack and damage cells and its constituents, especially DNA. It is thought that the antioxidant effects of olive oil inhibit peroxidation and reduce mitochondrial DNA damage, preserving vitality and youthfulness. It appears that Oleocanthal significantly contributes to olive oil’s anti-aging effects. The simple conclusion is that we need to up the olive oil component in our diet and preferably only use the extra-virgin variety, which contains the greatest proportion of active ingredients. Antonis Pothoulakis recommends a daily consumption of at least 40g, equivalent to two tablespoons, particularly if we are not eating food with a high oil content. We should bear in mind that this is quite a large calorie intake, so exercise is essential. Finally he points to the story of an Israeli woman who drank a glass of olive oil every day and lived to be 120. We should all take note.